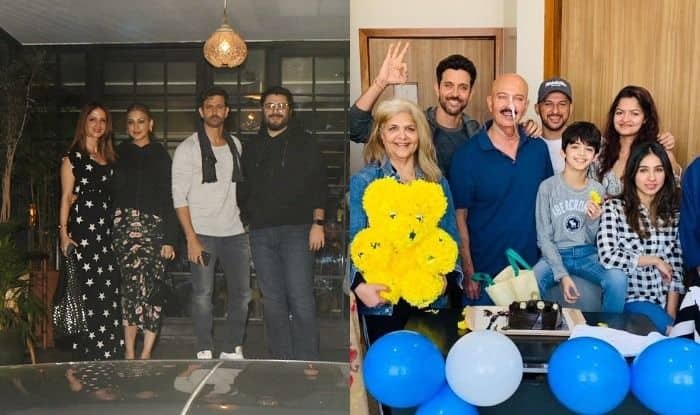 This is how Hrithik Roshan celebrated his birthday. Actor Hrithik Roshan celebrated his 45th birthday on Thursday. After spending quality time with father Rakesh Roshan and cutting the cake in presence of family members, he stepped out to dine with ex-wife Sussanne Khan in the evening. His close friends Sonali Bendre and Goldie Behl joined them. The actor looked dapper in denims that he paired with a grey t-shirt and accessorized the outfit with a muffler. Hrithik is proving that age is just a number for him. Sussanne looked gorgeous in a black maxi dress. Both the stars were all smiles as they posed with Sonali and Goldie. Hrithik also shared a picture with his father thanking everybody for praying for him. A couple of days back, the actor revealed that his Rakesh is diagnosed with squamous cell carcinoma and is undergoing surgery. On the professional note, Hrithik is gearing up for the release of his upcoming film Super 30. The movie is based on the life of mathematician Anand Kumar who trains impoverished kids for IIT. Initially, it was scheduled for January 25 release. The film was directed by Vikas Bahl but after #MeToo allegations against him, he was reportedly asked to step down. Now, there is no update regarding the new release date of Super 30. Hrithik will also be seen in a dance film with Tiger Shroff.